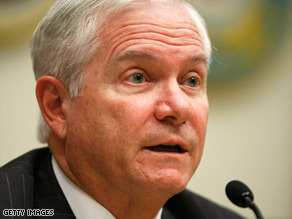 WASHINGTON (CNN) -- Defense Secretary Robert Gates on Wednesday defended his decision to shift budget funds to support weapons the U.S. military is using in Iraq and Afghanistan and away from research and weapons that may be used in future conflicts. Defense Secretary Robert Gates says the U.S. must be prepared for the wars "we are most likely to fight." "We have to be prepared for the wars we are most likely to fight. Not just the wars we have traditionally been best suited to fight or threats we conjure up from potential adversaries who in the real world also have finite resources," Gates said in testimony before the House Armed Services Committee. He appeared with Navy Adm. Michael Mullen, chairman of the Joint Chiefs of Staff. The budget decisions encountered some skepticism from the outset. In his opening remarks, Rep. John McHugh, R-New York, questioned the decision to cut spending from some of the development programs. "Can we really say that the threat of nuclear and missile proliferation is lower now than it was four years ago to warrant such significant reductions to missile defense? McHugh asked. "Are we so confident in our diplomatic efforts with Iran and North Korea that we can afford a nearly 90 percent cut in European missile defense and a 35 percent cut to our U.S. missile defenses in Alaska and California? Some of us, to say the least, are dubious." Gates is calling for more than $1 billion in cuts in the missile defense budget. In April, the secretary announced the budget changes he was recommending to President Obama in comments in Arlington, Virginia. "Even as we begin to shift resources and institutional weight toward supporting the current wars and other potential irregular campaigns, the United States must still contend with the security challenges posed by the military forces of other countries -- from those actively hostile to those at strategic crossroads," Gates said. "Last year's national defense strategy concluded that although U.S. predominance in conventional warfare is not unchallenged, it is sustainable for the medium term given current trends." The Obama administration has requested $533.8 billion for the Department of Defense in 2010.